The recently inaugurated Cuban president praised art as a way of building bridges. 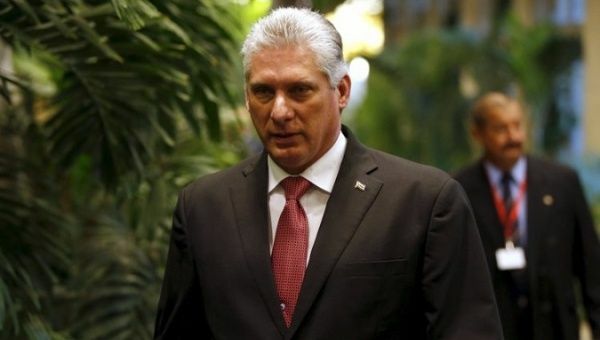 May 24 (teleSUR) Cuban President, Miguel Diaz-Canel, does not believe that the current hostile attitude of the United States toward Cuba can last forever, and believes that they can find the “will” and “points of contact” to move forward from a position of respect. The president was meeting with some of the Cuban artists who participated in the Festival of Cuban Arts that was held in Washington D.C. this month, and said that art can build bridged between the two countries. “I don’t believe that the current position will be eternal, and things like what you have accomplished in Washington… can open the way,” he said, praising the artists’ talent and commitment. “If there is the will, respect, and equality, we can continue back on that construction. From May 8-20, the Kennedy Center in Washington D.C. hosted the largest-ever Cuban arts festival in the United States. The occasion featured around 400 artists ranging from musicians, dancers, actors, filmmakers, fashion, design and cooking. Soon after a passenger plane crashed near Havana's airport last week, killing 112 people, Cuba's new president Miguel Díaz-Canel arrived at the scene as the wreck of the Boeing 737 still smouldered. Then he addressed the nation on state television, visited the morgue, the hospital where survivors were taken, and the hotel where family members of the crash victims were being put up until the bodies of their loved ones were identified. He hugged, gripped shoulders and listened. He met with the aviation authorities heading up the investigation of the crash and last Sunday visited emergency workers drilling on disaster responses to the coming hurricane season. The week before, he chatted with students at a high school computer lab, donned a hair net to tour a dairy processing plant that makes soy yogurt, visited a clinic in Havana's Lawton neighborhood, and stopped by an old technical school complex that had been converted into 145 apartments. He even visited a waste management site where he learned that 40 of the 90 trucks needed to collect Havana's trash were out of service. And those were just a few of the stops Díaz-Canel has made in the little more than a month since he assumed the reins of Cuba's Council of State and Council of Ministers from Raúl Castro, who still heads the powerful Communist Party. He's also met with visiting world leaders, hosted a gathering of the U.N. Economic Commission for Latin America and the Caribbean in Havana, and headed up a meeting to plan for the 500th anniversary of the city of Havana next year. Cuba's President Miguel Diaz-Canel dances with children from a theater group during the opening session of the Economic Commission for Latin America and the Caribbean meeting in Havana. When Díaz-Canel, 58, was selected for the post, there were broad questions about how he — decades younger than the historic generation of Cuban leaders and not even born at the time of the 1959 Revolution — might govern. Would he spend all his time huddled with his Council of Ministers working on continuity or would he prove to be more a man of the people? "What is interesting is what a public figure he's been. He's been on the front page of Granma almost every day," said William LeoGrande, an American University professor who focuses on Cuba. "There's a very public effort to communicate to Cubans that Díaz-Canel is the legitimate leader. He has recognized the importance of the symbolic role of the Cuban president." Cuba's new leader Miguel Diaz-Canel, left, and Raul Castro at Cuba's National Assembly on April 19, 2018. Critics of Díaz-Canel, including the Cuban-American delegation in Congress, have called him Castro's "puppet" and say the transition of power in Cuba was a "sham." On the island, his appointment to the presidency also was met with little enthusiasm by the Cuban population. Even as he assumed the presidency, it was clear Castro would still be in charge. In his speech at Díaz-Canel's inauguration, Castro said he will continue to head the Communist Party until the next party congress in 2021, and that the plan is to have the same person, presumably Díaz-Canel, at the helm of the party as well as the Council of Ministers and Council of State at that time. Until then, Castro "will spearhead the most important decisions for the present and future of the nation," Díaz-Canel said in his first speech as president. So at least until until 2021, Díaz-Canel faces a difficult political road. "He leads by consensus, not by force of personality," said Pedro Freyre, who heads the international practice at Akerman law firm and has clients who do business with Cuba. "I expect him to be very cautious until he gets his footing. He has a very delicate balancing act to perform between the competing interests of the FAR [the Revolutionary Armed Forces], the party, the ministries and the other Cuban stakeholders." Miguel Diaz-Canel, center right, and Raúl Castro observe the May Day parade in Havana's Plaza de la Revolución in 2018. In order to succeed as president, Díaz-Canel must be perceived as an independent leader, said Domingo Amuchastegui, a former Cuban intelligence analyst who now lives in Miami: "He doesn't want to be viewed as Raúl's protege or Raúl's baby. He needs to do his best and Raúl will back him up as strongly as possible." During his speech before Cuba's National Assembly of People's Power in April, Díaz-Canel signaled that he might be a more hands-on president who was interested in mingling and getting Cubans' opinions: “We will have to exercise an increasingly collective leadership, strengthening the participation of the people,” he said. As he waited in line with everyday Cubans to vote for National Assembly deputies in March, Díaz-Canel told reporters: "There has to be a focus on ties to, links with the people to listen to the people, deeply investigate the problems that exist and inspire debates about those problems." The topics he's focused on most recently — food and agricultural production, healthcare, education, the internet, housing and getting the garbage picked up — are all issues that resonate with the Cuban population. But politically, he hasn't deviated from the party's paramount goal: survival of the revolution and the Cuban state. "I think that by his style and the topics he's focusing on, he's showing that he's interested in continuity in politics but also understands the need for new blood in the Cuban state," said Arturo López-Levy, a lecturer at the University of Texas Rio Grande Valley and a former Cuban intelligence analyst. "Does having more contacts with the Cuban people solve the problems of the country? No," said López-Levy, but "it could make it less difficult to address those problems." Díaz-Canel — the first non-Castro president since 1976 — faces a difficult but necessary reform agenda set in motion but not fully implemented by Raúl Castro and mounting economic problems. Among the most difficult challenges that Díaz-Canel faces are unifying Cuba's unwieldy dual currency system and multiple exchange rates, attracting foreign investment, kick-starting Cuba's moribund economy and implementing reforms that will take Cuba toward more of a market socialism. Also left on his plate is constitutional reform and dealing with a tenser relationship with the United States. Analysts say he'll need every bit of political credibility he can muster to push through reforms that are needed to make the Cuban economy more sustainable but that could be unpopular because there will be winners and losers. "His most difficult task will be dealing with the consequences of necessary market reforms and the probable greater inequity that will result," said López Levy. "The delay in currency unification is probably the No. 1 thing preventing Cuba from having sustainable growth," said LeoGrande. "No. 2 is the inefficiency of state enterprises. Twenty percent of the state budget still goes to subsidizing state enterprises." The next big clues on how Díaz-Canel plans to govern will come in July when the National Assembly meets to approve his Council of Ministers. Castro has said the National Assembly also will set up a commission at that meeting to present a draft text of the new constitution, which will be debated by deputies as well as the Cuban population in coming months. "Raúl Castro will continue to be extraordinarily influential in decisions made at the party's Political Bureau level, but Díaz-Canel also is a member of the Politburo and has a seat at that table," said LeoGrande. "Raúl Castro has made it clear that he sees Díaz-Canel as his protege and wants him to succeed. This transition is very much like Raúl Castro himself — structured and calibrated." The primary factor in President Diaz-Canel's success will be his ability to engage directly with his people and to open the door for their creativity and energy. He must see the Party as only one vehicle for communication, no less self-interested than every other human institution. He has to overcome the near religious antipathy from some sectors to independent individual initiative and success, sometimes coincident with relative wealth but always linked to greater autonomy from overconcentrated power. Greater practical receptivity to foreign direct investment is vital but also to the infrastructure assistance provided by international financial institutions that have played an important role in Vietnam's dramatic development. The Trump Administration will doubtless oppose Cuba's entry into the World Bank and IMF, but it does not have veto power nor moral standing. If Secretary Pompeo restores normal functioning of the US embassy and consular section, he will frustrate those responsible for the inexplicable medical problems affecting US intelligence operatives and diplomats. A more positive US presence provides more space for innovation in Cuba. The Center of Sociocultural Anthropology “Samuel Feijóo” calls for the II International Workshop on Socioreligious Studies, as part of the II International Conference of the University of Cienfuegos which will take place on October 23rd -26th. Socioreligious studies began to be developed in the University of Cienfuegos fifteen years ago with the creation of the Sociocultural Studies Degree. Since then, investigations on the religious legacy of the region of Cienfuegos have been fostered. These researches have been complemented by post graduate programs and the Master´s Degrees on Historic Studies and Cuban Sociocultural Anthropology, as well as on Sociocultural Studies. As a result, today there is a significant number of researches on important topics such as families, institutions and religious manifestations. On the other hand, one of the goals the Center of Sociocultural Anthropology “Samuel Feijóo” is to promote investigations on the work of Bartolomé de Las Casas, the Priest who was closely related to the process of conquest and colonization of Cuba. The links of Las Casas with region of Cienfuegos as well as his transcendental thinking are significant topics to be investigated and socialized. 1. Theories and methods of study on religion. 2. Philosophic, anthropological, historic and sociocultural dimensions of religion. 3. Changes of the religious phenomenon: the catholic pluralism and the intricacies of the evangelic world. The Cuban religions of African origins. Heritage, culture and identity. 5. The religious and humanist legacy of Bartolomé de Las Casas. Panel 1. Theories and methods of study. Dimensions of religion. Panel 2. Changes of the religious phenomenon: the catholic pluralism and the intricacies of the evangelic world. Panel 3. The Cuban religions of African origins. Heritage, culture and identity. Panel 4. Bartolomé de Las Casas in the conquest and colonization. Significance of his work and his humanist legacy. The Casa de Iberoamerica is sponsoring its thirteenth Congress of Ideas October 25 and 27, 2018 in the Cuban city of Holguin. It attracts about 300 academics and writers from universities all over Cuba, with a preponderance from Holguin, Santiago, Havana, Villa Clara and Ciego de Avila. The Congress offers a strong intellectual anchor for a faculty led trip and an opportunity to develop collaboration with new schools and academic disciplines. For further information about the Congress, write to Arismaray Reyes Gonzalez <yaram5727@gmail.com> or John McAuliff <jmcauliff@ffrd.org>. Daily flights to Holguin are available on Jet Blue from Ft. Lauderdale and American Airlines from Miami.